In certain respects the idea has some merit for a transporter-less space-going society. Boarding an enemy vessel requires some sort of manual entry, after all. 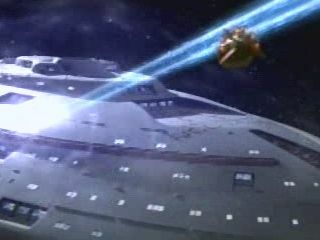 Other Trek episodes have shown enemies docking with disabled ships by airlock, grabbing ships and working on cutting through the hull, and the old favorite of trying to come in via shuttlebay. Given those options, the wee rammer has, at least, a greater dramatic flair. 1. The Kazon penetrator does not apparently aim for likely weak points like bay doors or windows. The vehicle penetrates the hull at Cargo Bay 2 which, though known to be a location that can have body-size objects vented into space ("Scorpion, Pt. II"[VOY4]) and which is clearly right along the hull, doesn't have the obvious-exit-route doors like at least some TNG cargo bays located on the hull. 2. 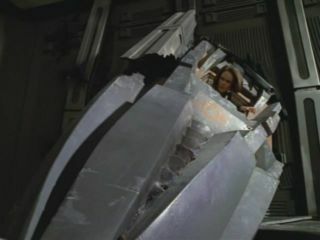 The Kazon were not in protective gear of any kind, which is a very odd proposition for a vessel designed to ram through the hull of other vessels while in space. It would be like not having scuba gear after crashing a midget sub through the hull of a nuclear submarine. 3. Although exhaustive work goes in to explaining how the penetrator gets through the shields, which was nice, Voyager is never seen to fire on the penetrator, despite the painfully slow approach the VFX guys chose to craft. 4. The impact is not seen, since with the still-mostly-model-work of the time it would've been a severe pain to try to show it. But, it means we have no clear idea on impact velocity. While probably quite low, given Trek vessel maneuvering and acceleration capabilities a last-second burst of speed after getting the final trajectory correct is not outside the realm of reason, though only to be added if absolutely required. 5. The vessel does way too much "ethereal" damage to Voyager. Despite only damaging the wall around the hole . . . the rest of the cargo bay was in great shape . . . the ship's structural integrity went to the toilet and continued to drop even after the impact, power was lost for at least part of the deck, and life support was failing on the deck. Even the warp drive was considered useless with the disruption the penetrator was causing to the warp field. This may be suggestive of more than a mere kinetic impact, however, since there is little obvious reason for such field disruptions unless the penetrator itself was putting out one helluva field. 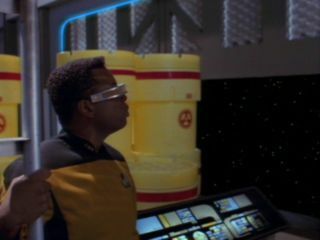 Really, though, the basic problem with the Kazon penetrator is that given the yields of Federation weapons, it is incongruous that a simple and slow kinetic penetrator should work. Maybe lots of technobabble about structural integrity fields or high-energy weapon penetration might be workable, but otherwise the whole thing is more than a little silly. Hence the mention above of the possibility of a higher final speed. In any case, however, now Star Wars is in on the act. 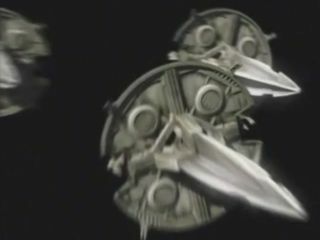 Apparently the same class of vessel as the Pod Hunters from the second episode (albeit with blades going from closed -> open instead of open -> crush), Separatist Boarding Ships are seen to have some rather surprising penetration capabilities. 1. The Separatist Boarding Ships do not apparently aim for likely weak points, just like the Kazon penetrator. They penetrate the hull near the flight deck doors, poking in through the 'garage' ceiling. 2. Unlike the Kazon who were not in protective gear, the Separatist boarding ships are manned by droids. That said, however, we do see another event of a ramming vessel getting a good, airtight seal. 3. The boarding ships also exhibit a slow and leisurely approach, though there seems to be a speed increase right at the end of the flight. Unlike Voyager, which just sat there and took it, the Republic vessel . . . identified as "Jedi cruiser Tranquility" . . . was shooting up the sky in advance of impact. However, they hit nothing consequential that we saw. Interestingly, we do not know anything about the status of the Venator's shields. Tranquility's commanding officer quickly identifies the boarding ships as the attack begins, notes the fighters we see (approximately a dozen of the vulture-droid type), and starts shooting, but that's about it. It's possible that the opening attack by three fighters did something to knock out the shields, but it is never explained. Of course, there are differences between Star Trek and Star Wars vessel shielding. 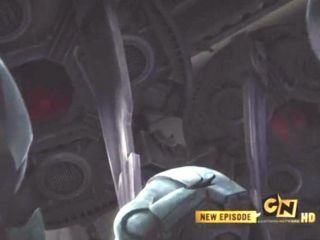 This episode includes reference to "outer shields", for instance, and we know of "ray shields" on sections of the exterior of the Death Star. 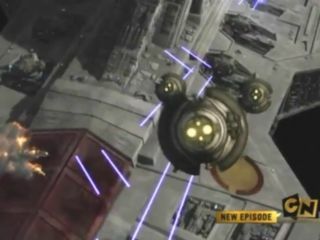 In RotS, the idea of landing on the Invisible Hand has a problem in that "the shields are still up", but this apparently only referred to the containment field at the door to the landing bay. In short, we don't know if something happened to the shields or if they were behaving normally. 4. The impact is seen, here. Eyeballing it based off the later scenes of super battle droids falling out of the boarding ships between the blades, and comparison with the pod hunter scenes, the collision happens at around 100 meters per second (4 meters per frame at a rate of 24fps for my source material). Assuming a mass similar to Trek shuttles of 30 tonnes, the kinetic energy works out to 150 megajoules, 0.036 tons of TNT, or the equivalent of 35 kilograms (75 pounds) of TNT. The temptation would be to consider this impact as focused on the forward point of the four blades as a good way to determine some facts about the hull, but I don't think we can make that leap. As you can see above, the flat forward midsection of the boarding ship hulls . . . the part forming the base for the blades . . . is completely visible! This incredibly-complete penetration is surprising. One would expect the blades to penetrate then somehow stretch open, making small but useful holes. Instead, the entire ship could have easily flown through. Equally surprising is that, just as occurred with Voyager, there is little to no debris on the floor or other local disruption. This not only gives us some possiblities regarding making estimates of hull thickness (e.g. far less than a meter), but tells us a lot about kinetic penetration of Imperial vessels. Needless to say, the asteroid shearing off the command tower is consistent with the boarding vessel performance. 5. How much other damage the boarding ship impacts did is unknown. We follow the fight to repel the droids at that point, followed in short order by Asajj Ventress disabling the ship by attaching grenade-sized explosives to the reactor area. In short, this example is at least as bad as the Voyager case. Instead of a one-off design, the Separatists have such vessels as a class. The Tranquility, seemingly shieldless and incapable of targeting the boarding ships, is readily and thoroughly punctured by 150MJ of KE. The only thing in favor of Tranquility is all of Voyager's "ethereal damage." If we take this example further, we would find that with the boarding ship being some four meters across, give or take, then we would have a Republic star destroyer incapable of repelling depleted uranium tank rounds from a modern-day Abrams, and maybe even having trouble with the A-10 Thunderbolt's rounds penetrating the hull. Of course, given that Republic tanks can penetrate the hulls of Separatist warships ("Downfall of a Droid"[CGI106], it perhaps should not be surprising that our own tanks probably could, too. In any case, there's hope for the nBSG vs. SW crowd. But doesn't that mean that Voyager's hull is just as weak as the Tranquility's and thus could quite possibly be pierced by a DU round as well? Voyager's hull was punched through by that Species 8472 guy. How many kilograms of TNT do his fists rate?